The minister stated this in Lagos at a town hall meeting organised by the Ministry of Information, Culture and Tourism. “The first railway contract in the revitalisation policy was awarded by former president Olusegun Obasanjo that is railway from Lagos to Kano; the next one was awarded by former President Goodluck Jonathan, Lagos to Calabar. “In all these there agreement with Chinese government that there will be counterpart funding of 15 per cent; we did not fulfil these agreements. “The only place they tried a bit was the Abuja, Kaduna and Kano, which is yet to be completed; and we are working extremely hard to ensure that between June and July we would commercialise that rail line. “That will reduce the challenges of production; to convey goods and services between Kaduna and Abuja. He added that his ministry would ensure the country’s rail lines were connected to the seaports in order to reduce the burden on roads and clogging of Lagos ports. “When we took over, we discovered that there is nowhere that railway doesn’t end up at the seaport; but this one did not end up at the seaport. “So what we did is to connect it to Calabar, Port Harcourt and Onne, and Warri Sea ports and then to either tin can or Apapa. “It means if you are in Onitsha you want to import through Warri that’s your business. He said that the Federal Government had commenced negotiation for the completion of the Itakpe-Warri rail line which had been abandoned for more than 32 years. “Nigeria has been struggling to construct that rail line in 32 years. “We are negotiating with a Chinese company that is ready to take up that rail line together with the Ajaokuta steel plant. “We would carry it all from Itakpe down to Abuja and then down to the sea port in Warri; that entire solid mineral axis will be covered but we have also introduced passenger trains as well. The minister further disclosed that the Federal Government had entered into agreement with the company, General Electric (GE) to revive the old Lagos to Kano rail line. He said the company in exchange for the project would build a University of Transportation in the country. “We have agreed with GE as follows. I give you Lagos-Kano, and you (GE) give me the following, because you can’t dump a technology on us and go, you must give us a University of Transportation,” he said. Amaechi said the university would train railway graduates, marine engineering graduates and aviation. He said the GE would build a factory that would produce the locomotives, wagon and the coaches in Nigeria. “Finally, we said to the company you will not take Lagos-Kano if you will not do Port Harcourt – Maiduguri; that again I think they have agreed, we have not concluded negotiation. “If all this is done in the next four years, we would have been able to connect the whole of Nigeria and reduce the impact that we put to convey good and services on the road,” he said. He was hopeful that the President Muhammadu Buhari- led administration would connect the entire country by rail by the end of his four-year term. He therefore appealed to property owners, who would be affected by demotion exercises to pave way for the construction, saying, “Please bear with us because without demolition there would be no rail line”. On aviation, the minister reiterated the Federal Government’s commitment to rejuvenate the aviation sector. He said, “I hear you loud and clear about the situation in aviation sector; not because of the comfort but because I want to be as proud as the Chinese or Ghanaians when you go to their airports. “Just take a step few metres from the current Port Harcourt airport you will see a brand new airport terminal under construction and by December they should finish that terminal. 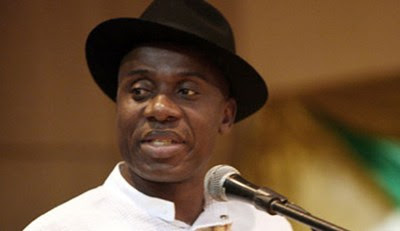 On maritime, Amaechi expressed worry that Nigeria’s maritime sector was not at par with its counterpart in other climes. Serving as an interactive platform for members of the public, representatives of organised labour, and farmers, physically challenged persons, traditional rulers, state executives, political parties, youths organisations, students, as well as executive secretaries of local governments were at the town hall meeting.